PARIS — Canadian satellite builder and geospatial-services provider MDA Corp. on Nov. 1 pulled back from earlier optimistic assessments of the global commercial telecommunications satellite business, saying strong customer interest in new satellites was not translating into contracts. MDA, which is more exposed to the commercial satellite sector than any of its competitors, warned investors that 2016 and 2017 likely will be flat-revenue years for telecommunications satellites. Compounding the problem, to a lesser degree, is that one of the principal commercial launch vehicles, the SpaceX Falcon 9, has been grounded since a Sept. 1 explosion during a propellant-fueling operation on the launch pad. 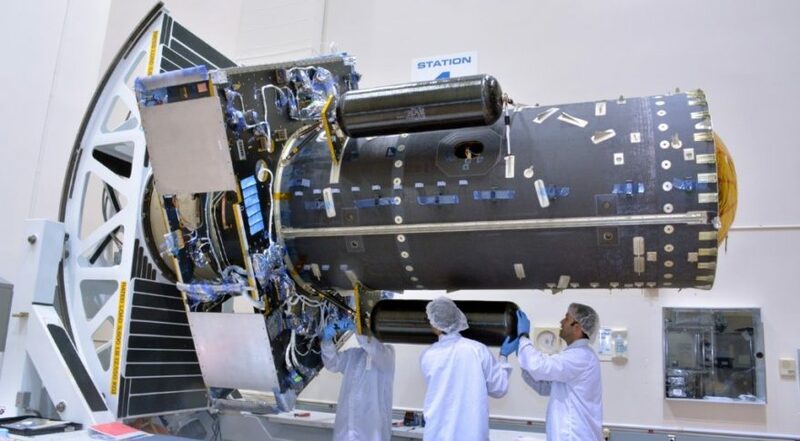 The SpaceX failure means satellites built by MDA’s SSL facility in Palo Alto, California, and planned for launch late this year will be delayed until early 2017. That will delay milestone payments to MDA. Addressing a conference call with investors, MDA Chief Executive Howard L. Lance insisted that “bid and proposal activity remains at record levels across both GEO, and LEO constellations,” referring to large geostationary-orbit satellites and low-Earth-orbit constellations of smaller spacecraft. But Lance said the 12 commercial geostationary-orbit satellites sold worldwide so far, of which SSL won four, suggest that 2016 will end with no more than around 16 orders, similar to 2015. That is well down from the historical average of around 20 satellites. Lance said customers are conducting multiple procurement competitions but stopping short of contract commitments as they question what kind of satellite they should order. High-throughput satellites (HTS) with spot-beam technology permitting the reuse of frequencies in a satellite’s footprint are upending previous assumptions among operators about what technology will be valid for 20 years or so — two or three years from order to launch, and then 15-18 years of in-orbit service. Lance said MDA remained bullish on the market’s overall health and on a recovery in 2017 or 2018, with full impact starting in 2018. Vancouver, British Columbia-based MDA’s California facility is hiring U.S. nationals with security clearances in an attempt to capture what the company believes is a huge opportunity in the U.S. defense and intelligence market. All MDA’s competitors are firmly rooted in the U.S. defense business. Historically, MDA and SSL officials said their focus on the commercial market gives them an advantage over their counterparts, who are used to less-competitive government orders. The numbers would appear to validate that thesis. SSL has been the most successful U.S. satellite builder on world markets in the past decade. One of the consequences is the buildup of what called “orbital receivables,” which is a percent of a satellite contract award withheld by satellite operators and paid out in annual increments — with interest — over a satellite’s operational life, assuming the spacecraft functions as designed. The receivable are often around 10 percent of the contract value. As of Sept. 30, MDA’s accumulated orbital receivable totaled 662.7 million Canadian dollars ($495 million). To monetize this, the company signed a credit facility valued at 400 million Canadian dollars to sell certain orbital receivables with remaining terms of seven years or less. On Sept. 30, MDA made an initial drawdown on this account of $72.3 million, resulting in net proceeds of $68.8 million after setup and transaction costs. The company is investing heavily in a U.S. business targeting military contracts and expects to have the required security clearances by the end of the year. For the nine months ending Sept. 30, MDA reported revenue of 1.12 billion Canadian dollars for its Communications division, which includes most of the satellite work. That is down slightly from the same period a year ago. EBITDA, or earnings before interest, taxes, depreciation and amortization, was 16 percent of revenue, up from 14 percent the previous year. The company’s Surveillance and Intelligence division, which includes services from the Radarsat 2 Earth observation satellite and space robotics work, an MDA specialty, reported 442 million Canadian dollars in revenue over the nine-month period, up 5.5 percent from a year ago. But EBITDA for the division was 24 percent of revenue, down from 28 percent a year ago as a result of a loss provision of 10 million Canadian dollars taken against a space robotics program. The program, which was not identified, is a firm, fixed-price contract, meaning MDA cannot bill excess costs to its customer. MDA Chief Financial Officer Anil Wirasekawa said the program has proved more technically complex than expected but that the company hoped to be able to reverse the loss provision later on as it recovers lost time and investment. Space Systems Loral in the past year has signed space robotics contracts with NASA and the U.S. Defense Advance Research Projects Agency. MDA said that for the nine months ending Sept. 30, 27.5 percent of its revenue was from U.S.-based customers and 26 percent from Canada. Asia was 21 percent of revenue, Europe was 19.5 percent, followed by south America at 4 percent and Australia at 1.6 percent. During the nine-month period, the Canadian government revenue was 204 million Canadian dollars. Revenue from the U.S. government totaled 93.5 million Canadian dollars.